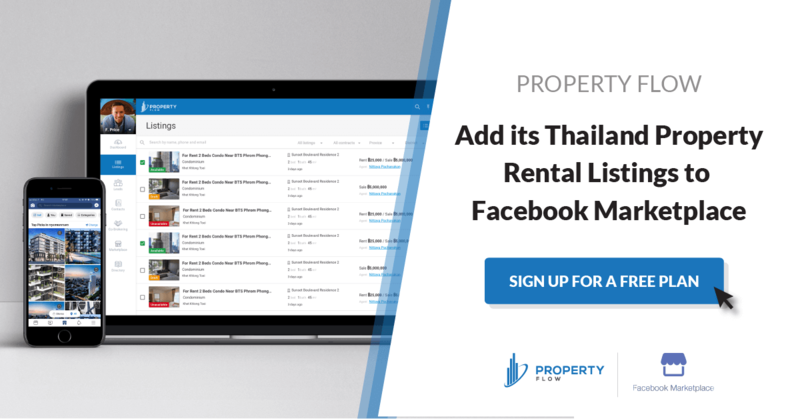 October 11, 2018 – Property Flow is happy to announce the integration of its rental properties with Facebook Marketplace as part of Facebook’s upgraded home rentals experience in Thailand today. Marketplace is a convenient destination on Facebook to discover a wide range of items, including properties for rent where home seekers can find what they’re looking for by filtering their results by location, category, and price. Real-estate professionals using the Property Flow platform can now opt-in to automatically synchronize their property listing inventory with Marketplace. By exposing the property listings to Marketplace real estate agents are able to get additional exposure and branding as well as increased lead generation. “Property Flow is very happy to announce a listing partnership with Facebook Marketplace in Thailand. Real-estate professionals in Thailand are already actively using Facebook to connect with home renters. By allowing real-estate professionals to list their properties on Marketplace, they will be able to reach new home seekers and provide high-quality property listings to all using the service. Property Flow is a technology company focusing on digitizing and improving the workflow of real-estate professionals in the South East Asian region. A wide range of services is provided to real-estate professionals including sales and marketing tools as well as online inventory management. Property Flow’s mission is to modernize and digitize offline real estate processes to help and increase efficiency, and revenue for real-estate professionals. Please get in touch for any questions or comments. Increase your sales opportunities and get more leads!